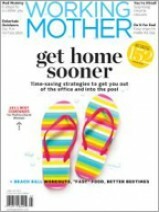 Free Subscription to Working Mother Magazine! I've been a subscriber to this magazine for over a year, and while much of the content is aimed at moms who work outside of the home, they are increasing their coverage of the work-at-home mom. Sign up is free (no credit card needed), although you will have to tell about your business. (Supplies are limited!) Please note that upon submission of your info, a new screen may pop up for Blue Dolphin magazines asking for your billing info. This page is NOT necessary to process your free magazine order. Looking for additional free business magazines? You might want to give TradePub a try!